A wood fire stove that is eco friendly! The cleanest wood burning heater that is rated EPA phase 2 on the market. Great for Geothermal systems, Aquaculture tanks and Swimming Pools. If you have a geothermal system that heats your home, you know that it is important to have a back up system in case there is an electric outage or your system needs maintenance. There are many back up systems but this page is dedicated to wood furnaces and when it comes to wood heaters the Wood Master Flex Fuel is our brand of choice. With the Wood Master Flex Fuel Series you can choose between pellets or cordwood depending on their actual market cost. With this flexibility you can always chose the least expensive fuel and control your savings. 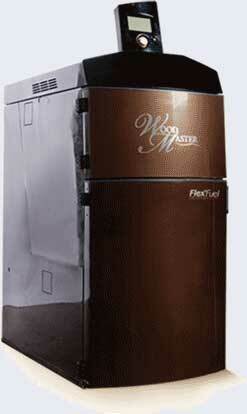 The wood master can easily be adapted to your existing heat pump system. Indoors, in the basement or garage or outdoors in an outbuilding. It is also ready to use with solar panels to help you save even more money. Their Furnaces are engineered with key features to maximize Btu delivered to your home. This gives you more usable energy for consistently comfortable home heating. The Wood Master can also be used to heat large volumes of water like a swimming pool at very low air temperatures or aquaculture tank when a low cost heating alternative is needed or as a heat pump back up system in colder weather.